Ferguson Online Auction — Harritt Group, Inc. 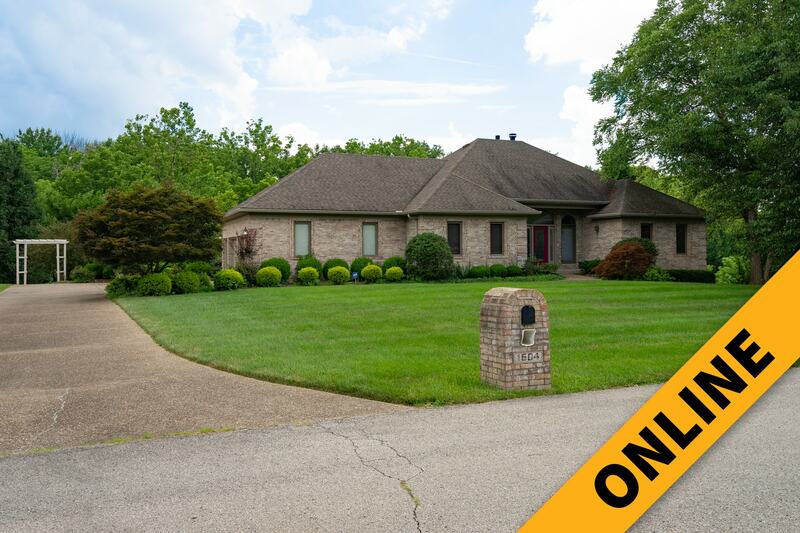 Filled with natural light and high ceilings, this modern spacious 4 bedroom – 3 bath home built in 1995 sits on 1.55 acres in Fox Run Estates off Utica Sellersburg Road only minutes from I-265 Utica Exit #11 and the new Lewis and Clark Bridge. This home offers 2558 square feet of living space on the first floor, a finished 640 square feet in a full walkout basement, split bedrooms with a private master suite, 2 fireplaces, wood deck plus attached 2-car garage. Also selling personal property including furniture, decorative arts, lawn equipment, tools and household items. Full of custom touches, this spacious walkout brick ranch with attached 2-car garage perfectly pairs peaceful suburban living with a private 1.55 acre lot in small established neighborhood with large lots. The kitchen, bathrooms and sunroom are filled with natural light from the skylights and the rooms are spacious with tall ceilings. The first floor features great room with hip vaulted ceiling, fireplace and a sunroom at one end overlooking backyard, functional kitchen with hanging pot rack over island, a breakfast bar, a built in desk, and dining area with french doors to a formal dining room. A large private master bedroom suite with a hip vaulted ceiling includes bath with jetted tub, separate shower, a double vanity and spacious laundry room just steps away. An additional 3 bedrooms and full bath have their own private wing. The full basement features a 20’ x 31’ family room with a fireplace, a wet bar and a full bath. The large unfinished area is perfect for storage or a workshop and houses 2 high efficiency gas furnaces, 2 hot water heaters and a water softener. Outdoor living space includes patio and wood deck overlooking deep lot bordered by Lentzier Creek. Part of the property is located in the AE Fringe however home has an elevation certificate from a surveyor removing it from the SFHA (Special Flood Hazard Area). Selling the contents including furniture, blown glass, pottery, antiques, tools and more. Watch for full listing and photos. (3) Piece dining room suite that includes large china hutch with (3) glass shelves, lighted and mirrored, buffet server and table with (2) table leaves and (10) chairs, four poster bed, (4) piece full size bedroom suite, retro blonde Lane cedar chest, painted antique dresser, art deco pedestal desk, highboy reproduction TV cabinet, (2) antique chairs, wingback chair, paisley accent chair, console table, lamp table, glass coffee table, ornate folding fireplace guard, vanity stools, (2) La-Z-Boy recliners, unnamed leather recliner, reclining leather couch, (3) metal bar stools, metal bakers rack, mid century end table, modern four panel room divider, dinette set, 12’ church pew, coffee and end table set, industrial rolling tables, metal cabinet and a retro wood file cabinet. Iron patio table and (4) chairs, (3) piece patio glider and chair set, retro tete-a-tete patio set, cast aluminum loveseat and end table, wood hanging swing, (3) hanging landscape lights, antique painted iron pump, iron kettle, large assortment of landscape decor including (8) planters and hanging sun sculpture. (2) Pieces of Roseville Pottery, (3) pieces of Zimmerman blown glass, (2) antique oil lamps, (3) pieces of stoneware, several pieces of assorted cast iron dishes including Griswold No. 273 corn stick. unnamed made in the USA cornstick, unmarked muffin pan and unmarked tea kettle, (4) piece unmarked graduated frying pan set and an unnamed No. 8 made in the USA chicken fryer with lid, Wilton Armetale aluminum oval serving trays, (8) pieces of copper cookware, Singer Slant-O-Matic 401A sewing machine, retro film camera and binoculars, Jarts box and contents, large selection of LP records, Shannon Crystal 12 piece tea set, Pfaltzgraff dishes, large selection of Corning Ware dishes, large selection of retro kitchenware including Pyrex dishes, vintage metal kitchenware items, fashion queen Barbie Carrying Case and contents, (2) retro porcelain lighted christmas trees, galvanized Falls City minnow bucket, antique rolling dictaphone, KIrby vacuum, Olympian wood sled, (3) retro Levi Strauss denim jackets and large selection of modern toys. Framed serigraph of Anatole Krasnyansky’s “Three Musicians”, framed and matted floral print, hanging mirror with ornate resin frame, unique hanging floral quilt, burgundy floral woven Tufted Rug, blue floral woven rug, (4) small area rugs, decorative iron pieces, framed “Cottage Memories” print by Thomas Kinkade, Longaberger J.W Collection 1986 edition Two Pie basket and hanging stoneware fishes, large selection of Christmas and holiday decor, metal folding chairs and card tables and a large selection of faux greenery. Large selection of tools and hardware including a Craftsman vise, Black and Decker workmate table, fishing tackle and poles, Craftsman Eager – 1 Edger/Trimmer, Craftsman 16″/38cc gas powered chain saw, Lawn-Boy push mower, STIHL FS-36 curved shaft weed eater and Ryobi leaf blower, (2) Electric hedge trimmers and (1) Craftsman electric chainsaw, 8′ Werner folding fiberglass ladder, aluminum 13′ extension ladder, primitive wood folding ladder, wheelbarrow, Scotts seeders, (6) plastic pump sprayers, gas cans, large selection of yard tools, garden tools and more. Whirlpool Heavy Duty washing machine and Amana commercial quality dryer and electric heaters. I-65 to I-265 East. 4.5 Miles to Utica River Ridge Exit# 11. Turn right on Old Salem Road and continue 1.2 miles towards Utica. Right on Downtown Fourth Street. 1/10 mile to right on Utica Sellersburg Road. 3/4 mile to right on Fox Run Drive. Or from Downtown Jeffersonville take Spring Street to Market Street/Utica Pike. 7 miles to left on Utica Sellersburg Road.